He has cast himself as a defender of the Jewish state, but his anti-interventionist stance puts him at odds with both the Israeli government and leading American Jewish groups. In January, Kentucky Senator Rand Paul made his first visit to the state of Israel, where he attended his first Shabbat dinner, saw the Sea of Galilee and visited the Western Wall. The trip, according to a National Review piece, "was one turning point in the transformation of Rand Paul from libertarian gadfly to viable presidential candidate," an effort undertaken by "a group of Evangelicals and Jews determined to help get Paul right with Israel." They may have to try again: Any good will he may have built up with that trip seems poised to vanish as Paul now finds himself on the opposite side of major Jewish groups, pro-Israel lobbyists, and the expressed opinion of the government of Israel when it comes to supporting a U.S. strike on Syria. Already by June, Paul was being condemned in Haaretz as "The single greatest danger to Israel’s standing in the U.S." for his desire to end all foreign aid, including aid to Israel. In July, he riled feathers at Jewish and conservative pro-Israel groups when he temporarily defended his neo-Confederate aide and book co-author Jack Hunter. Now, between toying with the idea of filibustering the Senate vote authorizing use force in Syria (a position he's subsequently walked back), his contention that there's little difference between deaths from chemical weapons or bullets, and his invocation, during the Senate Foreign Relations Committee hearing Tuesday, of concern for Israel as his reason to vote against a U.S. intervention that Israel backs, Paul seems certain to once again cement his place as someone standing way outside the mainstream of pro-Israel thinking on the right. "Is it more or less likely that Israel will be attacked? I think there are valid arguments for saying the region will be more unstable if we get a superpower involved in a civil war, more unstable for Israel if we get a superpower involved and the Syrians feel like they have to show Israel something, or Iran gets involved," Paul told reporters after the Senate hearing. He elaborated on his opposition in a Time magazine piece Thursday. And while the continuum of pro-Israel thinking in the U.S. encompasses a diverse array of opinions, it is the thinking on the right side of the political spectrum that will matter for the junior Paul when it comes to making a 2016 potential presidential bid. "Rand Paul is a guy who wouldn't support U.S. military action to stop Iran from getting a nuke, or to defend our ally Israel if Iran were to attack them, so it's no surprise he won't support military action to stop Assad from using WMD, either, let alone to ensure American leadership or credibility in the world," said one official with a pro-Israel organization. The Republican senator's "lack of understanding of the world, let alone America's role in it or our interest in Israel's security, is so profoundly confused that [it] has disqualified himself from being taken seriously in the conversation," he said. Conservative Jewish and Pro-Israel groups have shown remarkable unanimity on the subject of a strike. The Republican Jewish Coalition issued an action alert this week in support of the use of force resolution. So has AIPAC, the main pro-Israel lobbying group in the United States. "AIPAC urges Congress to grant the President the authority he has requested to protect America’s national security interests and dissuade the Syrian regime's further use of unconventional weapons," the group said in a statement issued Tuesday afternoon. "Simply put, barbarism on a mass scale must not be given a free pass .... That is why America must act." The lobbying group also issued an action alert, urging supporters to write letters to members of the House and Senate calling on them to "grant the President the authority he has requested to protect America’s national security interests and dissuade Damascus from further chemical weapons use." And it is preparing to launch an unusual effort to lobby members of Congress on behalf of the Syria resolution -- something it did not do for either the war in Iraq or Afghanistan. Israeli leaders had "remained completely quiet on how they thought the US or the west should respond," The Jerusalem Post reported earlier this week. But that changed late Tuesday, when Israeli Ambassador to the U.S. Michael Oren posted on Facebook: "Israel agrees with President Obama that the use of chemical weapons is a 'heinous act' for which the Assad regime must be held accountable and for which there must be 'international consequences.'" Other major Jewish groups also weighed in. “Those who perpetuate such acts of wanton murder must know that they cannot do so with impunity,” the Conference of Presidents of Major American Jewish Organizations, which represents 52 national Jewish agencies, said in a statement backing the use of force. "We welcome President Obama’s demonstration of U.S. leadership in responding to the use of chemical weapons in Syria," said Barry Curtiss-Lusher and Abraham H. Foxman, national chair and director, respectively, of the Anti-Defamation League in a statement. "We support the president’s decision." On Wednesday the Jewish Council for Public Affairs, an umbrella group for 14 national and 125 local Jewish groups, also endorsed the use-of-force resolution. So did the progressive Jewish Daily Forward, based in New York. "We believe it is important for American Jews to state out loud what Israelis are understandably constrained from saying: Congress should work with President Obama to craft a measured but powerful military response to the Assad government’s use of chemical weapons against its own people, and to ensure as best as it can that even the worst consequences of such an attack are anticipated and, if possible, ameliorated," Jane Eisner, the editor-in-chief of the Forward, wrote Wednesday in a strongly worded editorial calling for U.S. intervention. Even J Street, the progressive alternative to AIPAC, has been more forceful than Paul on the Syria question. "J Street is outraged by, and condemns in the strongest terms, the Assad regime's use of chemical weapons against the people of Syria," the group said, quoting Kerry's statement of last week that "the indiscriminate slaughter of civilians ... by chemical weapons is a moral obscenity." "The United States and the international community must hold President Assad and all responsible for this heinous crime fully accountable," the group said, though it stopped short of calling outright for a military intervention. Some of this rather one-sided outpouring of opinion has been prompted by the White House, which has made it know it would like some public support from the pro-Israel camp for the course of action the president is proposing. And while there are real questions about what the long-term consequences of an attack will be for Israel, the public statements of the pro-Israel and Jewish groups couldn't be plainer. "Will Israel be more likely to suffer an attack on them, a gas attack or otherwise, or less likely?" 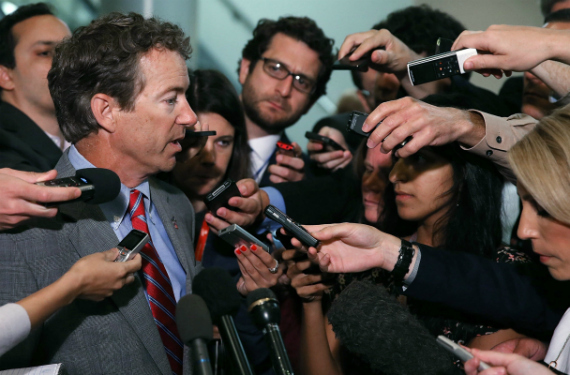 Paul asked Kerry Tuesday during a Senate Foreign Relations Committee hearing. "I think there's a valid argument for saying they'll be more likely to suffer an attack if we do this." Kerry forcefully disagreed. "You will notice that Israel has on several occasions in the last year seen fit to deal with threats to its security because of what's in Syria, and not once has Assad responded to that to date," he replied. Prime Minister Binyamin Netanyahu has said Israel is ready for whatever is to come, and on Tuesday Israel conducted an unannounced missile test over the Mediterranean, creating jitters in the area as it showed off its anti-missile shield technology. Also worth noting: Israel has conducted bombing raids inside Syria on four occasions in the past year, so far without retaliation. “Sen. Paul has said before that bombing Syria may increase attacks on Israel and instability in the Middle East. It also puts America on the same side as al-Qaida in this civil war. Military action in Syria is not in the national security interest of the U.S. or Israel," Moira Bagley, Paul's communications director, told The Atlantic. Israel apparently begs to differ. One of Paul's likely 2016 competitors, Marco Rubio, also voted against the use-of-force resolution in the Senate Foreign Relations Committee, but his argument against it has struck more hawkish conservatives as better reasoned, and he has not sought to spearhead a drive against the resolution, instead rejecting the rising tide of Republican isolationism even as he rejected the measure. Whether or not that will position him more favorably than Paul in 2016 is as hard to predict as the outcome of the conflict in Syria, but it's less likely to annoy people in the present. "While we welcome Senator Paul's concern for Israel's security, we are inclined to trust the assessment of the Israeli prime minister over his," said Noah Pollak, executive director of the Emergency Committee for Israel and a frequent hawkish critic of Obama's conduct of U.S. foreign policy. And there's the rub for Paul. While his isolationism may, indeed, rally Tea Party types and Republicans weary of war to his side, it will not come without a cost. That cost is how he's viewed by another community he's sought to build ties with in advance of a presidential bid.